Hi. I remember this was such a great concert. The stadium was packed, and before the show there was a huge push to get through the turnstiles - I recall folding my arms in front of myself and being lifted up by the crushing crowd and moving down the hallways to the auditorium without my feet touching the ground - it was frightening, but incredibly exciting. 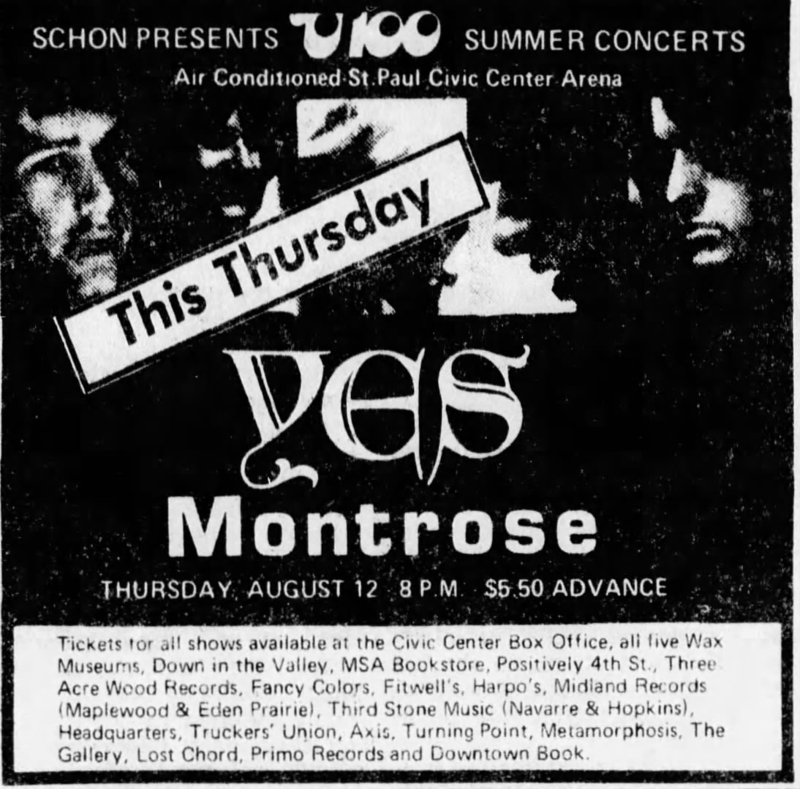 When in the theatre Montrose played first, and was generally ignored by the crowd who were waiting for yes to appear. There were tons of pipes being passed down the rows of people in front of the stage. My older brother who arrived late said that when he was let into the auditorium's upper deck the cloud of smoke that rolled out of the doorway practically blinded him from entering. 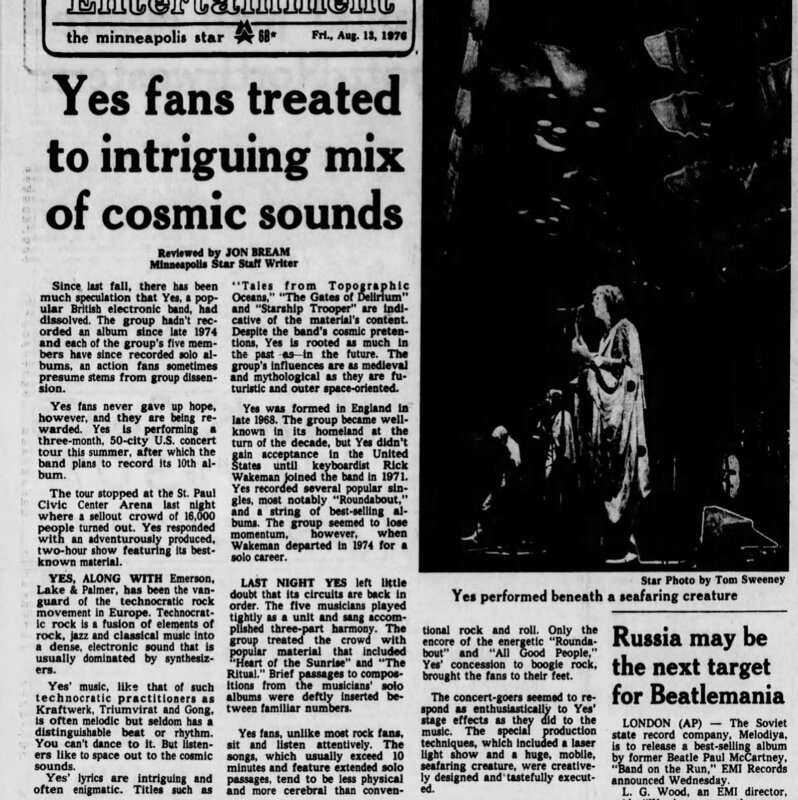 The music was spectacular, and the light show was incredible - even for the 70's! I recall how amazing the laser show was at the top of the concert - lasers! Huge octopus tentacles with giant pods on the top filled with stage lighting. The amazing Relayer inspired backdrop. The rotating drum kit platform. The feeling I had from most people (and for myself) was being just dumbfounded and utterly absorbed into the atmospheres that the band created with their music. While I'm sure the creators of Spinal Tap were "inspired" to a great extent by Yes (and it IS a hilarious parody), I think it's pretty undeniable that they had huge integrity and absolutely no one in music has yet done what they did.